1st Anniversary Paper Roses (deep red): Traditional Wedding Anniversary Gift! These paper roses are a meaningful first anniversary gift. The traditional first anniversary gift is paper. Fresh roses are great, but only last a few days... These paper roses are beautiful, surprisingly realistic, and last forever! 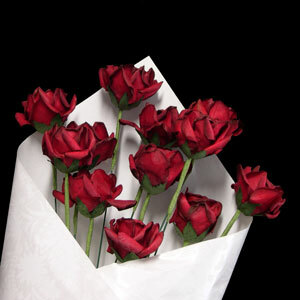 Customer Responses for our "Dozen Paper Roses (Deep Red)"